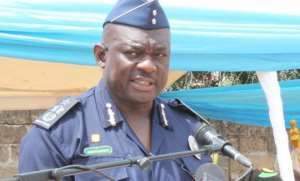 The Inspector General of Police (IGP) David Asante-Apeatu has cut a sod for the construction of the first Brong-Ahafo Regional Police Training School at Kenyase Number One in the Asutifi North District. The 240-capacity single-storey building block being funded by the Newmont Ahafo Development Foundation (NADeF) consists of a junior staff bungalow, library, laboratory, auditorium, clinic, visitors and commercial area. IGP Asante-Apeatu who was at the place as part of his three-day working visit to the region thanked the Kenyasi Number One traditional council for the initiative since the project would help in the fulfilment of the Police Service transformation programme to uplift the Ghana Police Service to an international standard. The IGP was in the region to interact with Officers and Commanders in the Service to ascertain their challenges and identify how best to address them to enable them to deliver more efficiently through the provision of adequate security and protection of lives and property. He mentioned that the transformation was based on the 13 strategic plans stated in the government's Party manifesto that included; the establishment of two additional Police training schools to beef up security situation in the country. He added that the project, on a22-acre land would be a legacy for posterity. Nana Osei Kofi Abiri, the paramount Chief of Kenyasi Number One advised pupils and students in the area to take their academic work seriously to enable them to acquire the necessary employable skills to qualify for recruitment into the Service for them to benefit from the project. Nana Abiri said the traditional council was ready to render the needed support for the project to its completion because the country could not progress without effective provision of security, peaceful political and socio-economic environment. Mr Kwaku Asomah-Cheremeh, the Brong-Ahafo Regional Minister, on behalf of the Regional Coordinating Council pledged 200 bags of cement in support of the project. Meanwhile, the IGP and his entourage also paid a courtesy on Nana Bosoma Asor Nkrawri II, the paramount Chief of Sunyani and the members of the Sunyani Traditional Council before he met media for an interaction to end his visit to the region. Nana Nkrawri appealed to the IGP to help for the development of 200 acres of land donated to the Regional Police Command by the Sunyani Traditional Council over 40 years ago. He said the land was meant for the construction of a Police barracks, a modern basic school and a befitting regional Police Hospital, saying that vision if realised could be of immense benefit to the Police and the general public. The IGP in response stated that budget for the construction of the Police Hospital in the region had already been submitted for the sector Minister to study and when approved project would be awarded on contract for commencement.